London designjunction is one of the most important design trade shows in the world and attracted around 27,000 visitors in 2016. 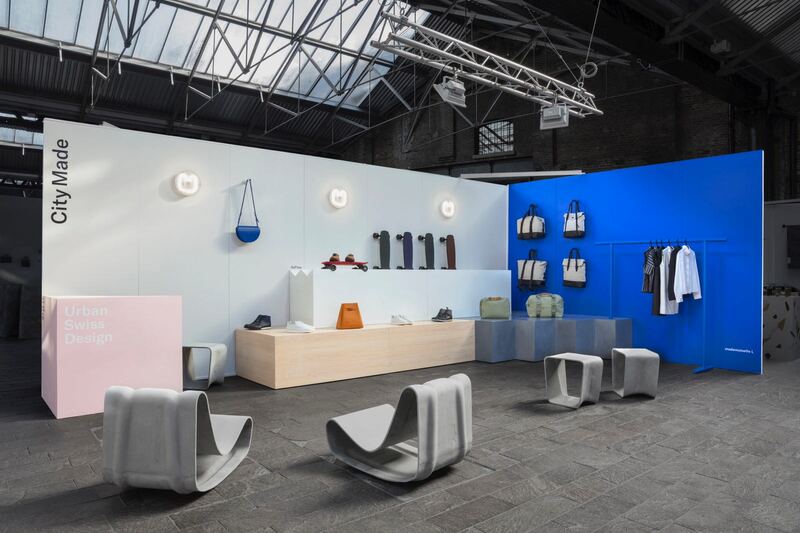 For the 2017 edition of London designjunction, Pro Helvetia showcased four brands based in the product areas of fashion, luggage, footwear and transportation are a testament of to the functionality, craftsmanship and forward-thinking approach that the Swiss have become famed for. Mademoiselle L : The label of Geneva-based designer Laurence Imstepf produces fashion ranging from street-style to sportswear – well-suited for everyday use, comfortable and always with a feminine touch. Qwstion : For this young baggage and accessories label, a new work process always begins with a good question. The answers provided by Qwestion take the form of high-end bags, rucksacks and coats. SOFLOW : Based in Flawil (canton of St. Gallen), Soflow turns electromobility into a design experience. Its latest creation is an electric skateboard named Louboard. Velt : They never managed to find the shoes they really wanted. So Patrick Rüegg and Stefan Rechsteiner decided to create their own. Their idiosyncratic product lines have already twice won them a Swiss Design Award.